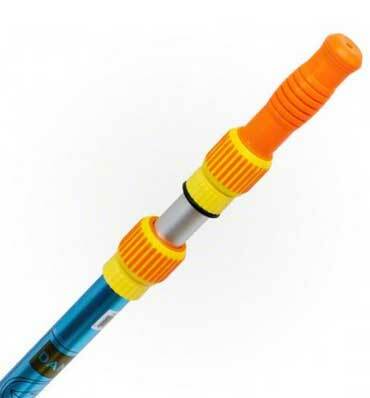 The Pool Pals Stinger telescopic pole is perfect for all sizes of swimming pools and is made of durable, extra strength aluminum to prevent rusting, reduce weight and improve durability. The Stinger features an easily adjustable, Dual Locking Cam design for easy length adjustments and a TPE outer cam grip for better comfort and grip. The pole telescopes from 5' to 15' in length and you can quickly attach all standard pool brushes, nets, vacuum heads other accessories designed for swimming pool poles.